Bamboo accessories are fast becoming a fashion trend as the raw material can be easily sourced and used in multiple ways. 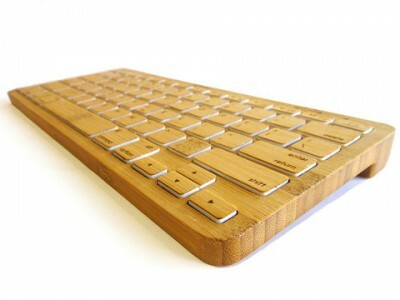 One such electronic consumable application of bamboo is the Bamboo Bluetooth keyboard from iZen. The use of bamboo does away with plastic panel which often end up in landfills or is incarcerated. Not only does this reduce the pollution associated with using plastics, but also reduces the carbon footprint for the product manufacturing cycle as the basic raw material is naturally available. The device is a wireless keyboard and uses Bluetooth technology to communicate with the computer. It can be used for normal computers, Apple iPad’s, iPhones and Android tablets with Bluetooth protocol. It entirely built with bamboo which includes the case and keys and is both attractive as well as Eco-friendly. The device has a built in rechargeable lithium-ion battery and charges with a USB 2.0 cable which is included in the package. It works well with Mac as well as Windows powered computers and comes in Mac styled keyboard layout along with multimedia keys. The product just weighs 1.1lbs and can be purchased online from http://www.izenbamboo.com/. It costs $9. Do also check out their other utility product ranges made from Bamboo which include a sleek iPhone case, an Ipad Sleeve, a desktop Bamboo keyboard with mouse and many more. Using Bamboo is an Eco-friendly alternative to plastic and also looks unique and stylish too. iZen Bamboo is a Colorado based company which uses Bamboo in all its featured product and contributes 1% of its profits to environmental organizations worldwide. Bamboo grows much faster than regular trees and does not require any special soil, fertilizers or pesticides and can be used for diverse applications.